Digenis Akritas (or Ackritas) (Greek: Διγενής Ακρίτας) is the most famous epic poem that emerged out of the 12th century Byzantine Empire, following the Acritic songs tradition. The Arab incursions into Byzantine territory are the context within which the first part of the tale unfolds, the events in the part of the narrative concerning the family history of the central hero seem to be located beyond a climate of conflict. The reconciliation of the two peoples through the marriage of the leading figures of the tale and the triumph of Christianity over Islam, achieved through the conversion and reception of the emir and his people into Byzantine society, is the key theme of the first part. The rest of the story unfolds against a background of peaceful coexistence of the two peoples. Written in Medieval Greek by an anonymous author, it marks together with the other acritic poems the beginnings of Greek vernacular literature. 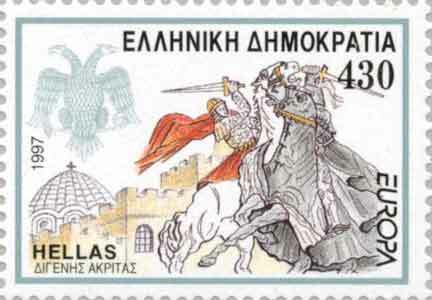 The Digenis Akritas is an extensive narrative text, although it is not in a pure epic-heroic style. It survives in many manuscripts and versions, the oldest two being the Escorial (=E, 1867 lines) and Grottaferrata versions (=G, 3749 lines), from the names of the libraries in which the respective manuscripts are held. While it should be noted that the form (or forms) in which it has survived is not the product of oral composition, it has nevertheless retained a considerable number of features of its oral origins. The common core of the two versions preserved in the E and G manuscripts goes back to the twelfth century. The text of E appears to be closer to the original composition while G represents a version that is heavily marked by learned reworking. Both texts give enchanting descriptions of the life of the martial societies of the border regions of the empire, while in the figure of Digenis are concentrated the legends that had accumulated around local heroes. The Escorial version is the superior of the two in respect of the power and immediacy of the battle scenes and austerity of style. The epic descriptions of the mounted knights and battles are marked by drama, a swift pace and lively visual detail. The Byzantine - Arab conflicts that lasted from the 7th century to the early 11th century provide the context for Byzantine heroic poetry written in the vernacular Greek language. The acrites of the Byzantine Empire of this period were a military class responsible for safeguarding the frontier regions of the imperial territory from external enemies and freebooting adventurers who operated on the fringes of the empire. The work is comprised of two parts. In the first, the "Lay of the Emir", which bears more obviously the characteristics of epic poetry, an Arab emir invades Cappadocia and carries off the daughter of a Byzantine general. The emir agrees to convert to Christianity for the sake of the daughter and resettle in Romania (Byzantine, Roman lands) together with his people. The issue of their union is a son, Digenis Akritas. The second part of the work relates the development of the young hero and his superhuman feats of bravery and strength: like his father, he carries off the daughter of another Byzantine general and then marries her; he kills a dragon; he takes on the so-called apelates, a group of bandits, and then defeats their three leaders in single combat. No one, not even the amazingly strong female warrior Maximu, with whom he commits the sin of adultery, can match him. Having defeated all his enemies Digenis builds a luxurious palace by the Euphrates, where he ends his days peacefully. Cypriot legend has it that he grabbed hold of the Pentadaktylos (Five Fingers) mountain range in Arab occupied Cyprus in order to leap to Asia Minor (Present day Turkey), the mountain range, as the name suggests, resembles five knuckles sprouting from the ground. Digenis continued to be read and enjoyed in later centuries, as the text survives in various versions dating to as late as the 17th century. The epic tale of Digenis Akritas gave rise also to a cycle of Acritic songs, some of which survived today. 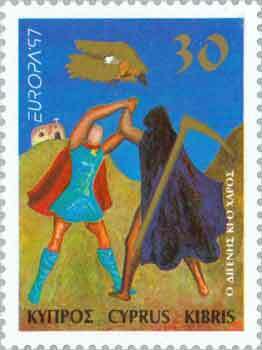 In the later tradition Digenis is eventually defeated only by Death, in the figure of Thanatos/Charos, after fierce single combat on "the marble threshing floors". Thanatos had reportedly already wrestled with Heracles. Digenis Akritas is written in the demotic medieval Greek and is composed in fifteen syllable blank verse. Rhyming occurs rarely. The poem does not diverge from the standard political verse of popular Byzantine literature. Each line holds its own and every hemistich is carefully balanced. The poem flows, is cadential, with no cacophonies with very scarce sound repetitions. 32] Ευθύς εκαβαλίκευσαν, 'ς τόν κάμπον κατεβαίνουν. .
 και ώς αετοί επέτουντα και εσμίξαν οι δύο. και ο ίδρος τους εξέβαινε απάνω απ'τα λουρίκια. και θαυμαστός νεώτερος ήτον ο καβαλάρης. και εχέρισεν ο αμιράς να τρέμη και να φεύγη. μή εις σύντομόν του γύρισμα πάρτη κεφαλήν σου. Αυτός καλά σ'εσέβηκεν τώρα να σε γκρεμνήση. αλλά μή το καυχάσεται ότι έτρεψε φουσάτα." "Να ζής, καλέ νεώτερε, εδικόν σου είναι το νίκος." They mounted at once and they came to the battlefield. They soared like eagles, and the two clashed. And then you could see a fight between fine brave youths. and their sweat ran out over their breastplates. and its rider was a marvellous young man. and then the emir began to tremble and flee. so that he doesn’t take your head off with his sudden turn. He has made a fine attack on you and now he might finish you off.
" but don’t let him boast that he routed an army." May you live and rejoice, young man, for victory is yours."